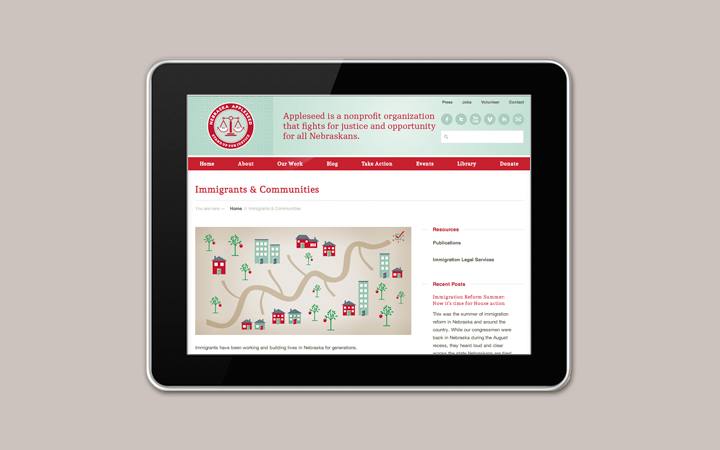 A new identity unifies a team of passionate activists who stand up for justice on behalf of all people in Nebraska. Justice fighters find their voice. 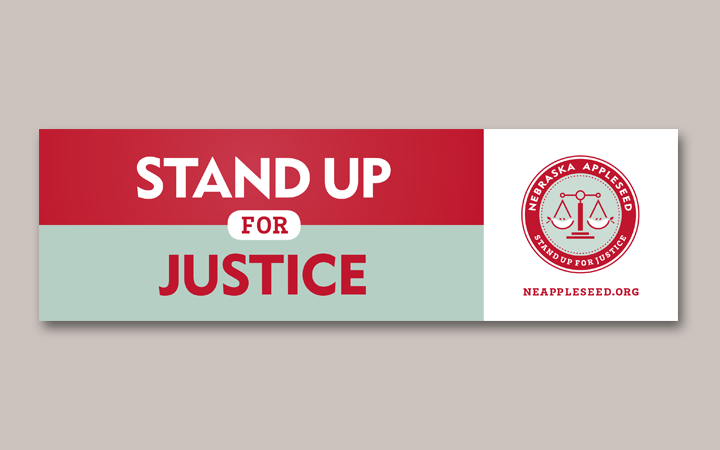 Nebraska Appleseed is a nonprofit organization that fights for justice and opportunity for all Nebraskans. 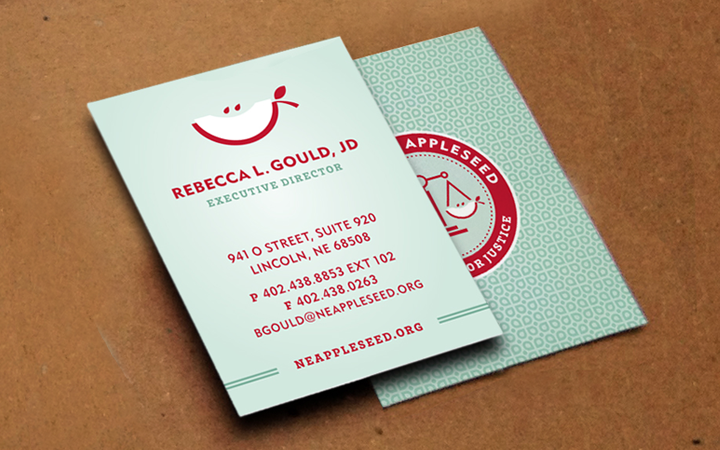 This branding project transformed Appleseed into a strong and unified organization with an iconic brand. 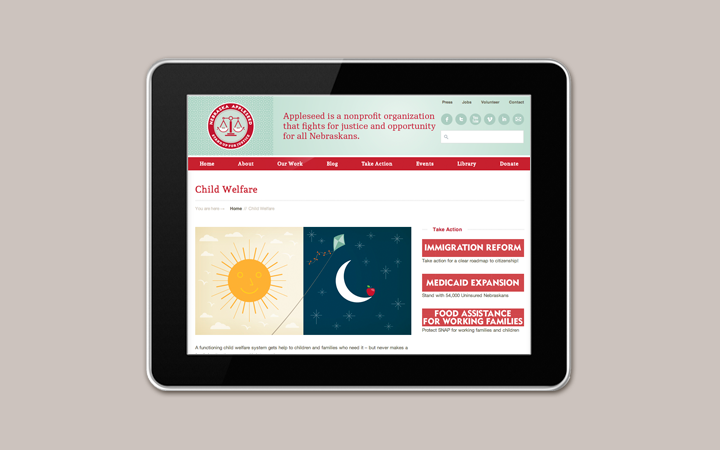 When Appleseed came to us they had been around for more than a decade, but few people outside the legal community were aware of their work. 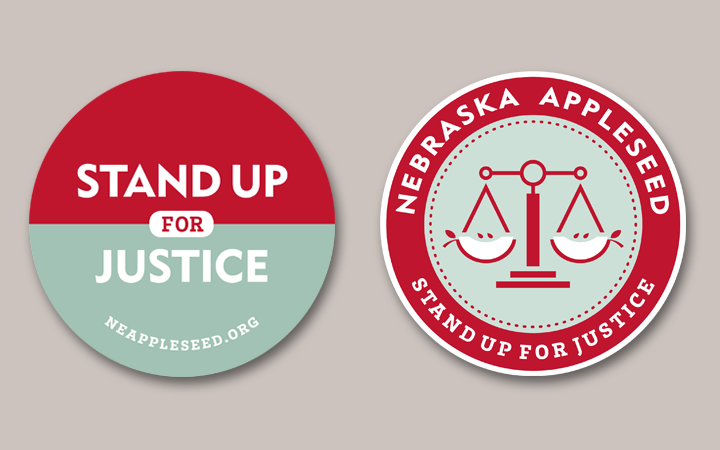 For Appleseed to gain ground as an organization they had to become a brand that was memorable to all people who care about social causes in Nebraska. 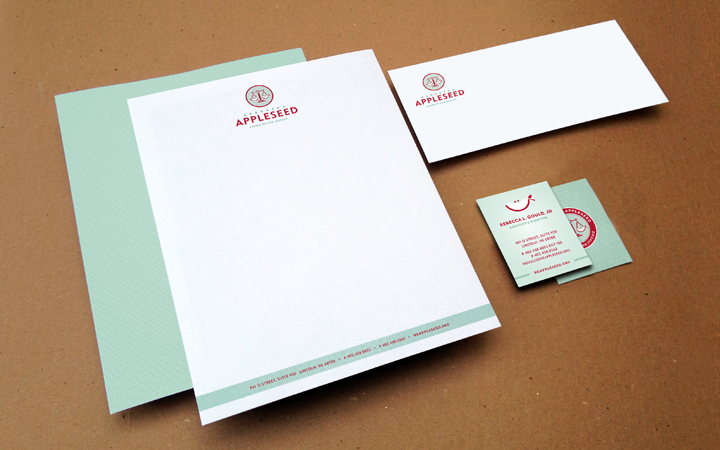 • Updated the Appleseed brand through the use of iconic graphics and patterns, a distinct color palette and 2 memorable logos to choose from. 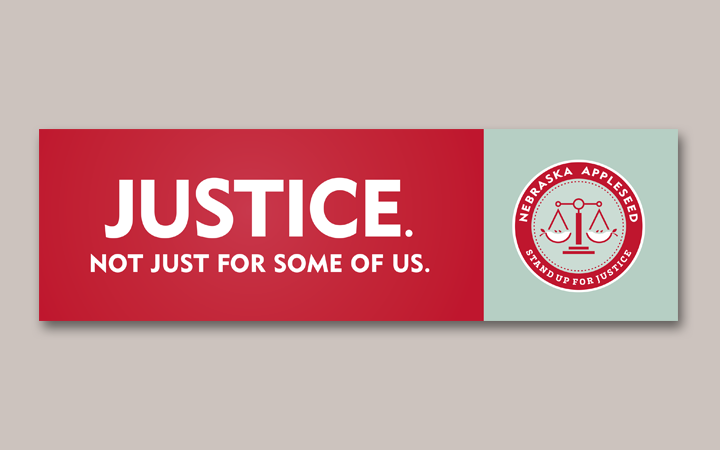 • Worked with the internal team to understand and embrace that they are a collaboration of passionate activists who stand up for justice for all people in Nebraska. • Helped them define their voice and developed messaging to communicate more clearly and consistently about their work. • Updated all their social media accounts with the new banding and advised them on initial posts and editorial calendar. • Used digital printing for their information sheets so they could change out content and messaging for multiple audiences very inexpensively. 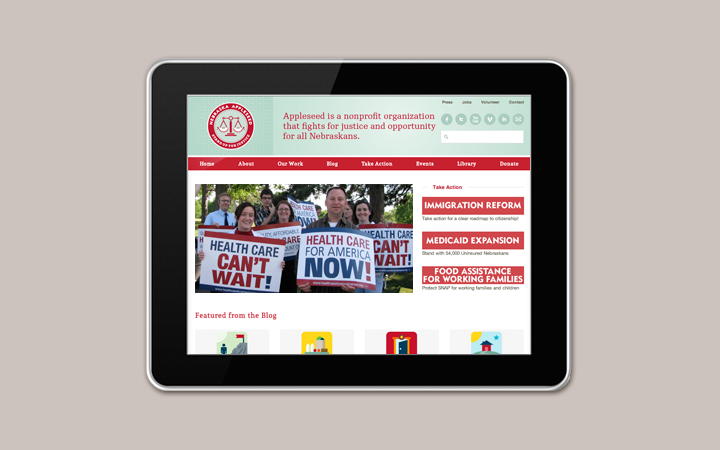 • Added a volunteer button and sign-up form on the new site. • Developed an easy and no-cost “to-do” list encouraging them to attend local non-profit and social cause meetings and community events in order to gain brand awareness and motivate volunteers to sign up. • Created portable displays, a series of bumper stickers, brochures and buttons to hand out at events and meetings. • A standards guideline was developed to build and maintain brand cohesion. 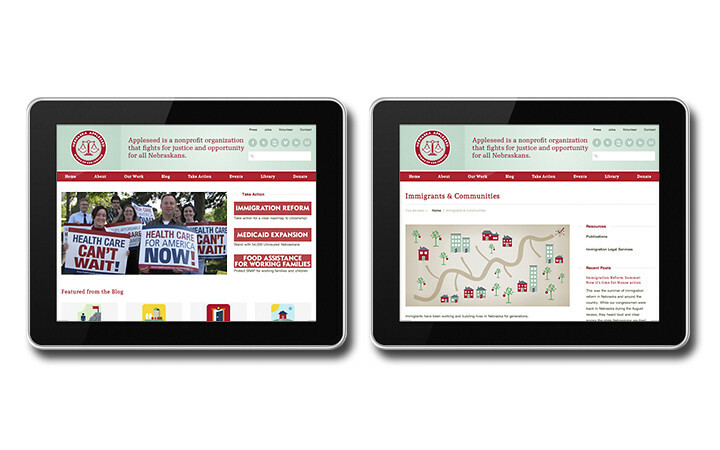 The iconography-rich brand refresh and unifying voice spoke to employees, constituents and supporters. There has also been a significant rise in traffic to the website per month as well as a huge increase in volunteer sign-up, tripling their support and donor base that remains steady to this date. 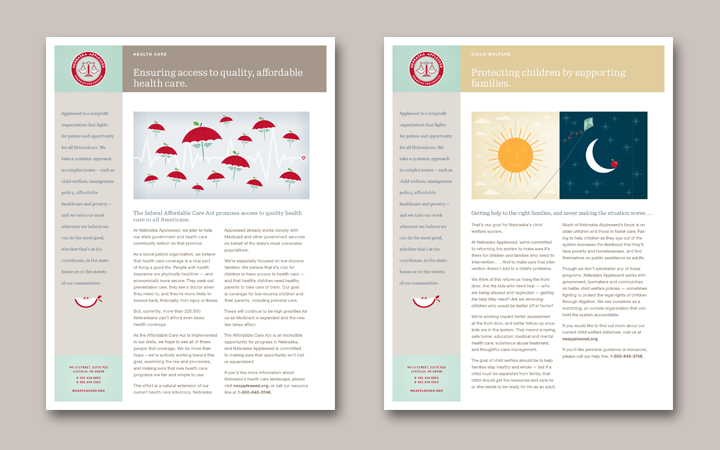 Numerous articles and interviews along with regular speaking requests for presentations about their work, continue to poor in both locally as well as nationally. They have taken on the leadership role of Nebraska’s compassionate advocates for justice in the community and haven’t looked back. We were proud to help them find their voice.